Welcome to our buyers guide for adjustable ride height coilovers. 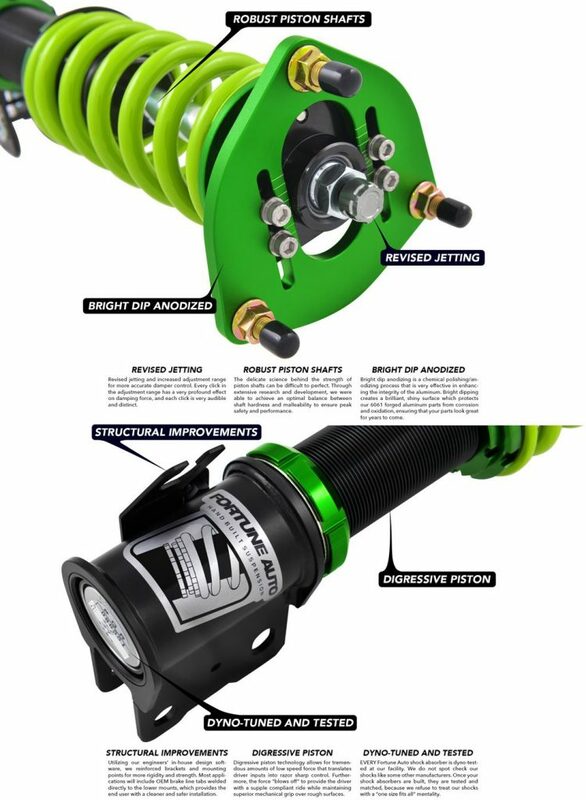 Are you ready to upgrade your vehicle with an aftermarket performance suspension upgrade? We suggest you take a look at adjustable coilovers. 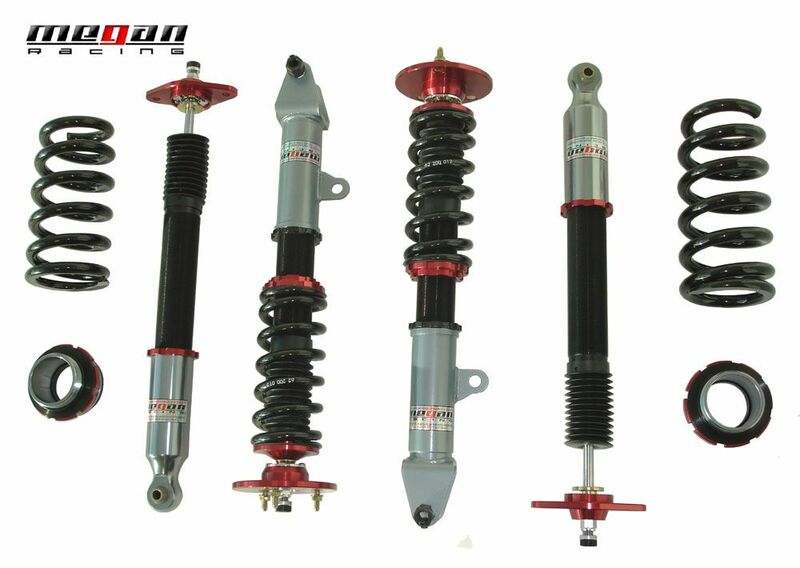 We have been selling top name brand coilovers for more than 10 years now. Driven By Style LLC offers over 20 brands of coilovers to choose from. Coilover kits are made to be adjustable so you can set your ride height as low as you wish typically up to as much as a 3" drop. The way the suspension is adjustable is through the use of a threaded shock body or threaded spring perch that allows you to move the spring up or down and making the overall length of the suspension shorter. With modern coilovers most use a threaded shock body that allows the overall unit to become shorter. The spring perches are also on an adjustable collar and this is so that "pre load" can be added to the spring so it remains under tension with full travel of the shock damper. This provides a suspension that is able to perform at it's best no matter what the ride height is set to. What is an adjustable damper? Adjustable damper settings allow you to fine tune the ride quality for comfort or to tighten it up more for performance driving. When you install basic lowering springs on your vehicle you cannot adjust the ride height or the ride quality. 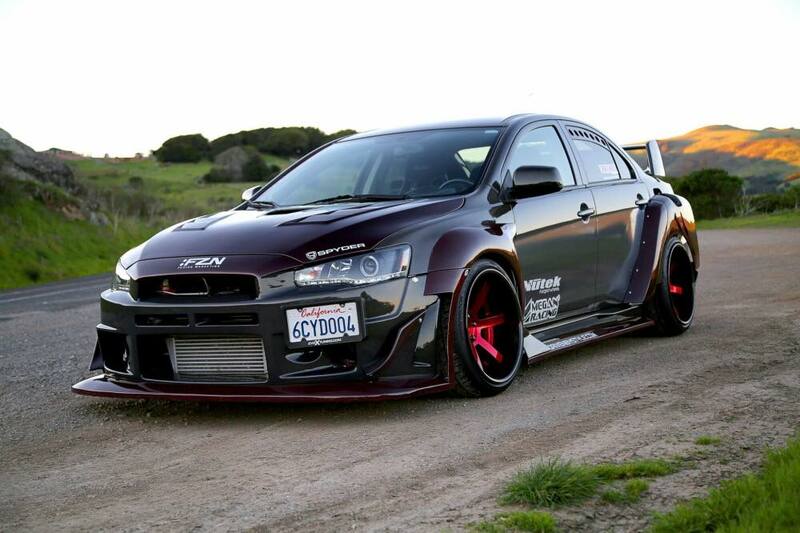 With an adjustable damper coilover kit you can adjust the height to just where you want it. Additionally you can adjust the ride comfort to what suits your needs on that day. This means you can turn the damper adjustment knob to a soft setting for a comfortable daily commute and then on the weekends if you want to hit the canyons you can stiffen up the ride like a sports car. 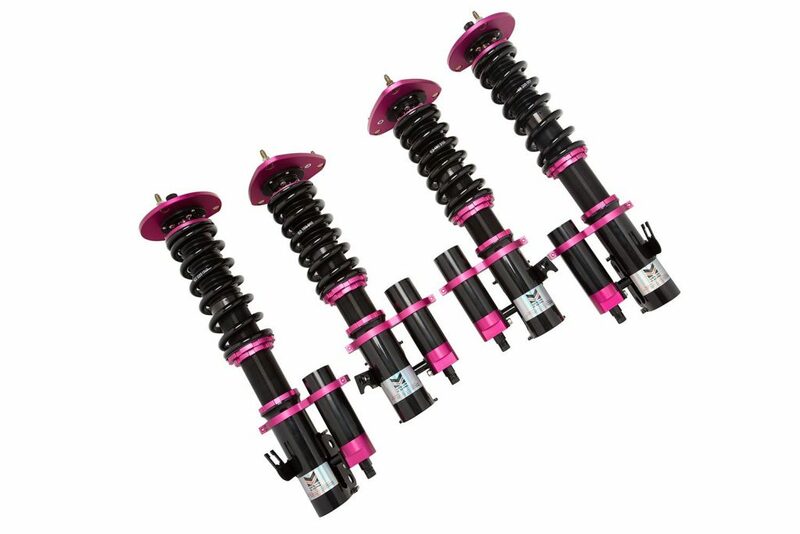 Most coilovers we sell come with a 15, 32, or 36 way adjustable damper. For instance some of our high end coilover kits also add an adjustment to control the rebound of the coilover. This is useful for high performance vehicles that see some track time either at autocross or road racing. Here is a great video from ISC Suspension on how to adjust your damping settings. When you want your coilovers to perform correctly you must ensure that your preload is set correctly. Follow your brand specific coilovers instructions when dialing in your pre load after install. Below is a very informative video on setting your coilovers preload with a demonstration on ISC coilovers. What brands does Driven By Style sell? Check out our featured brands of coilovers in the links below. We offer free shipping on most coilovers that we carry. If you find coilovers from these brands at a lower price please contact us for price match.